Our Single King Cabin features 1 bedroom with a king bed and flat screen TV with cable. The full sized bathroom has a spa-style rain shower head and floor to ceiling tile. The kitchen includes a refrigerator and freezer, sink, microwave, two burner stove and coffee maker with complimentary coffee. 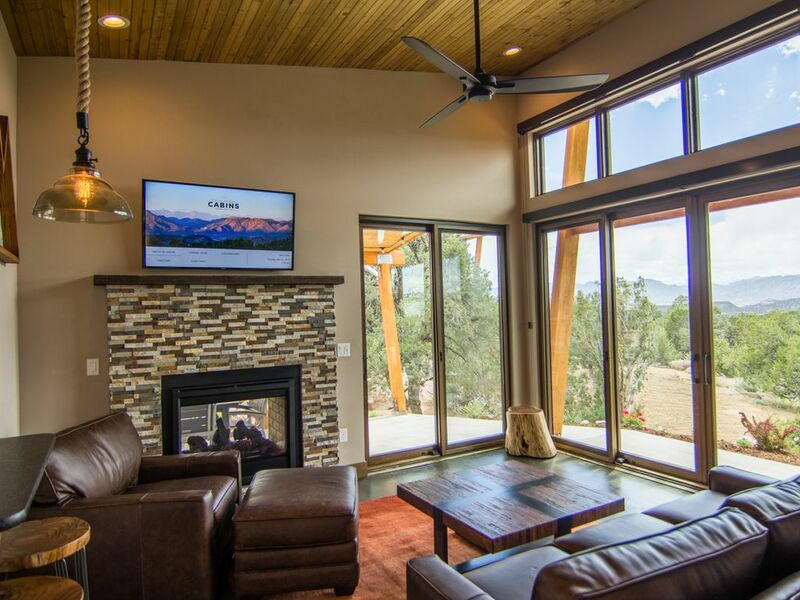 The living room has a sofa, large screen TV, as well as a gas fireplace that can be enjoyed from inside or outside on the private patio. The Single King Cabin has a maximum occupancy of 2 guests. Gas fireplace in living room is two sided - the fire can also be enjoyed from the private outdoor patio. Living room includes a large screen TV with cable, and leather sofa. Salt and pepper, sugar and creamer packets. No other pantry/food items are included in cabin rental. Kitchen includes refrigerator/freezer, sink, microwave, dishwasher, two burner range, coffee maker and complimentary coffee. Kitchen does not include an oven. Utensils and tableware for 4 guests. Outdoor dining table on private patio seats 4 guests. Indoor granite counter top seats 2 guests. Flat screen cable TV in bedroom and living room. Natural landscaping around unit with native grass areas. Private 400 square foot outdoor patio with dining table and two lounge chairs.